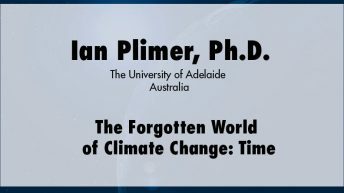 Ian Plimer, Ph.D. is chair of mining geology at The University of Adelaide and emeritus professor of Earth sciences at The University of Melbourne, where he was chair and head from 1992 to 2005. He was previously German Research Foundation Chair at Munich, chair and head of geology at The University of Newcastle. He has been elected honorary fellow of the Geological Society (London), fellow of the Australasian Academy of Technological Sciences and Engineering, and fellow of numerous other scientific societies and has won several medals for science. He has published some 130 scientific papers and seven books for the general public. Four of these books have been best sellers, the latest of which is Heaven and Earth: Global Warming - The Missing Science.